Affected by the judgement are the candidatures and the re-election of Senator Ovie Omo-Agege representing Delta Central senatorial district; Great Ogboru, the Delta APC governorship candidate, among others produced by the primaries conducted by the Erue-led executive. 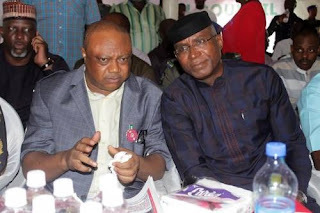 The lingering legal battle between the Great Ogboru/Ovie Omo-Agege faction of the Jones Erue-led All Progressives Congress (APC) executive in Delta State, and the O'tega Emerhor faction of the Cyril Ogodo-led state executive over the wards, local government areas and state congresses, took a more dangerous dimension on Monday with the sack of the Erue executive. In a suit marked FA/ASA/CS/76/2018, the Emerhor faction of the Cyril Ogodo-led state executive had dragged the Ogboru/Omo-Agege faction of the Jones Erue-led Delta APC executive, Adams Oshiomhole, the APC National Chairman, and the Independent National Electoral Commission (INEC) to court over the conduct of the wards, local government areas and state congresses. Among other prayers sought by the plaintiffs was a declaration that candidates that emerged from the primaries conducted by the Ogodo-led executive constitute the authentic list of candidates for the 2019 general election. In November 2018, the Federal High Court sitting in Asaba, the Delta State capital, and presided over by Justice Tosin Adegoke, had restrained the APC National Working Committee from submitting the list of all party candidates for the 2019 elections from Delta State to INEC. The court ordered Oshiomhole, APC, INEC, Jones Erue and the plaintiff to maintain status quo and desist from submitting any list of candidates from Delta State from the two factions to INEC till the substantive suit filed was heard. Delivering her judgement on Monday, Justice Tosin Adegoke, the presiding judge of the Federal High Court 1, Asaba, held that the O'tega Emerhor faction of the Cyril Ogodo state executive remains the authentic state executive of the party in the state and nullified the wards and local government executives of the party under the Erue-led state executive. According to Justice Adegoke, every action embarked upon by Erue as state chairman of the APC were null and void. The ruling also voided the emergence of all candidates from the primaries conducted by the Erue-led executive. However, Nwachukwu Okubor, counsel to the defendants, said they would go to the Court of Appeal to challenge judgment, even as he expressed hope that the judgment would be upturned at the appellate court. On his part, Roland Ekpe, counsel to the plaintiffs, said the judgment did not fall short of their expectations, stressing that all the nominations done by the Jones Erue-led executive in the 2019 general election were illegal, null and void. Ebata Onojeghuo, the state legal adviser of the Erue-led executive, told our correspondent that the said judgment was inconsequential, as the consent judgment they got from a Federal High Court in Abuja was not set aside. He added that all actions taken by the Erue-led executive, including nomination of candidates were empowered by the consent judgment. On his own, Cyril Ogodo, the state chairman of the party, commended the judgment, and the judge, whom he said “in spite of all the intimidation, blackmail and frivolous petitions went ahead to deliver a landmark judgment”. “What an incorruptible judge. Justice is alive in Nigeria. We hail Her Justice of the Federal High Court 1, Asaba, for her boldness. This is to confirm that illegality can never stand the test of time,” he added.